Dr. Jeanette Mladenovic brings 35 years of experience in academic administration. 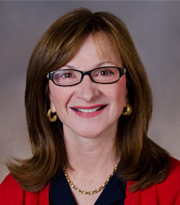 Prior to her current position, she served as Executive Vice President and Provost at Oregon Health and Science University, where she conceived of and developed the Campus for Rural Health, the Interprofessional Initiative with its integrated simulation center, OHSU Global in SE Asia, and a unique School of Public Health in partnership with Portland State University. Locally, she served on the OMSI board, and the K-20 Business Council’s Education Taskforce. Nationally, she has served on the Boards of Directors for Internal Medicine and the Professors of Medicine; the American Board of Medical Specialties, and the Accreditation Council for Graduate Medical Education. Mladenovic enthusiastically opines, “WOU is a special place. Its history of commitment to diverse communities of students makes it essential in the Oregon landscape of higher education.” Mladenovic obtained both her bachelor’s degree and her medical degree from the University of Washington, earned an MBA from the University of Miami, and has advanced training from the Wharton School and Harvard Negotiations Institute.